Or opting to browse for your zip file. 3. The model will take a moment to upload. 4. You will be prompted to change basic settings including model name, privacy, dimensions, and description. You can also edit more advanced settings such as model scene effects. Click on the tabs to edit the various settings. The system will then provide warnings if applicable. 6. 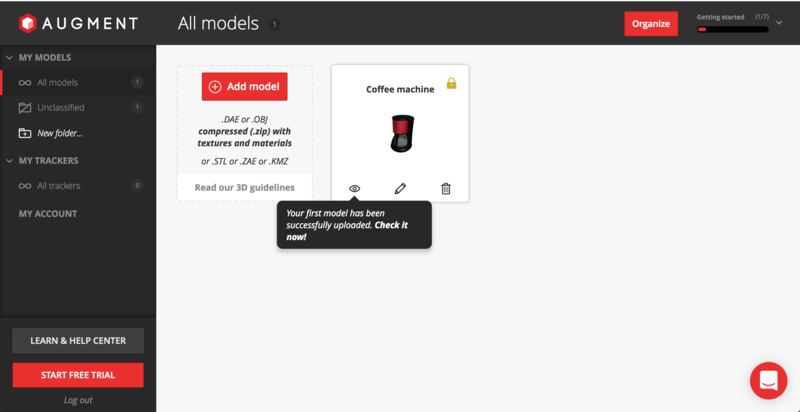 Once you get confirmation that the model is uploaded, view the model from the Augment app. You can also select the eye icon to scan a QR code to launch your model, to get a sharing link. 7. If you are not satisfied with your model, select the icon represented by a pencil and you will be taken back to step 4. 8. There you can choose to either change the settings of the model or switch the source zip file with the option ”Update file”. It will then take you through steps 4 to 6.